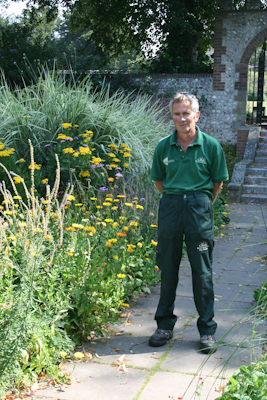 George is Gardens Manager for the grounds of Preston Manor; that’s the area to the north of the north park road including the churchyard, walled garden, wildlife area and beds. He helps out in the rest of the park as and when needed; for instance, he’ll be helping in the Rose Garden soon. George has had the role for 11 years before which he was at the Kipling Gardens in Rottingdean and he was also foreman at the Royal Pavilion Gardens. Just about everything – there’s nothing to dislike! What contribution do you make to the park? I’ve seen a lot of changes. I suppose the obvious thing is the Walled Garden. When I arrived in the job contractors were laying foundations [the gardens were being rejuvenated following the award of a grant] so the garden was started from scratch. I didn’t design it but I double-dug the lot and planted it up with the help of the volunteers. What’s the best thing about the park? The best thing is the diversity of uses: so many different people use it for so many different things. It’s such a welcoming area. And your ambitions for the park? One day I’d like to see one big team operating together so that we can all muck in together and sort out all the areas of the park. Things have taken an upward turn since the Friends of Preston Park got going; there are more new ideas coming in for the park. I retired a couple of years ago and took my RHS gardening exams. I have been working as a gardener, part time for the past two years and would be very happy to help in any way I can with the grounds of Preston Manor. Hi Celia, there is a gardening group organised by the Friends of Preston Manor that takes place every Tuesday Morning from 10:00. I’m sure that you would be more than welcome to join in. Just wear appropriate clothes for gardening and bring along a pair of gloves if you have them.